'Favosity' Website and Blog is all about bringing information on products that are part of a wholesome, healthy lifestyle. With that in mind, I truly recommend Ecco Bella's line of facial cosmetics. I personally use these cosmetics, and they are my very favorite. They are also 100% suitable for those with chemical sensitivity. "Glides on sheer. It's aloe based, and feels weightless but provides excellent moisture retention and coverage." "Improves the look and feel of the skin with its naturally derived, healthy ingredients." "Gentle to those with sensitive skin. No animal testing/ingredients. A Foundation, Skin Treatment & Sunscreen in One. Made in USA." * Ecco Bella Face Powder - This can be used over their liquid foundation, or as a powder make-up on its own. 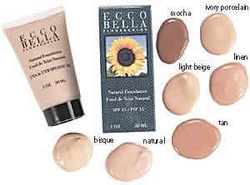 Used as a powder foundation, Ecco Bella's Face Powder also provides sun protection as a natural 'physical' sunscreen. "A luxe eco-compact filled with the finest, talc-free FlowerColor Face Powder, fortified with aloe, vitamin E, green tea and our flower wax pigments." Ecco Bella Cover-Up Stick - Concealer in Beige and Medium Beige that provides true, flawless coverage. "Easy on the skin, non greasy, good coverage, chemical-free, fragrance-free. Gluten-free." * Ecco Bella Bronzing Powder - Pressed Compact Highlighter in Hibiscus and Sunflower (first photo below). * Ecco Bella Shimmer Dust - Can be used as an eyeshadow or face powder. Creates a glow with a minimal amount of color. * Honeybee Gardens - For shimmer in a loose powder form, try Satin Sheets stackable Mineral Color for a soft golden glow. * Ecco Bella and Honeybee Gardens Cosmetics are available at iHerb, and Amazon (see links below). Both also offer Free Shipping. * See the next page for more great Ecco Bella cosmetic products for the cheeks, in addition to 'MyChelle' blush - both all-natural, and fragrance-free!